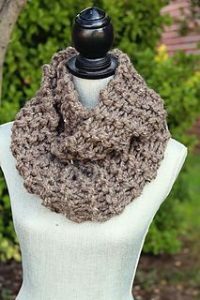 The fast one hour crochet cowl pattern is the great first crochet project for a beginner since it only uses one stitch! 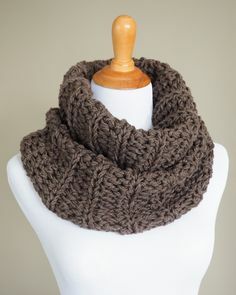 I decided to use Cozy which is a stout, stocky yarn so it would work up quick and fast. If you have any questions please write a comment about this pattern or leave me a message. Have fun! 2 skeins of Loops n Threads Cozy Wool or 180 yards of super bulky (6) yarn. After round 14 fasten off with scissors and weave in loose ends throughout cowl with yarn needle. 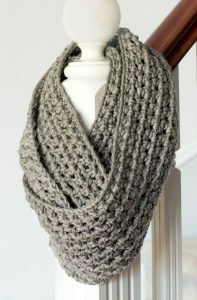 You can gift this crochet cowl for your family and your friends! 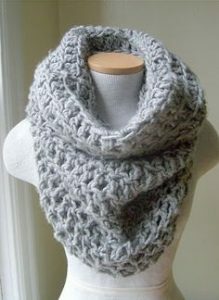 I hope you will like this crochet cowl pattern!